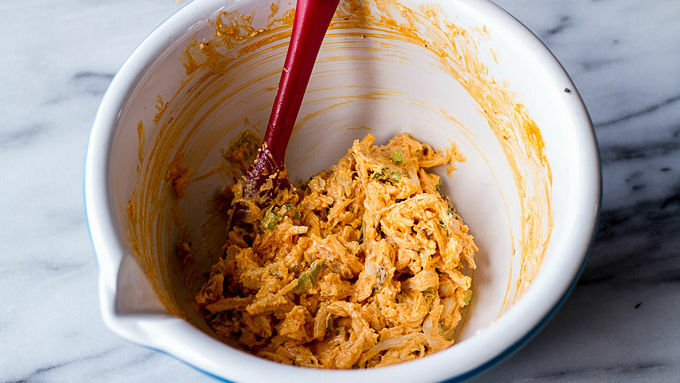 In a bowl, mix together the cream cheese, cheddar cheese and buffalo sauce. Stir in the shredded chicken and green onions. Unroll the pizza dough onto a counter. Using a sharp knife or pizza cutter, cut the dough into 8 strips. 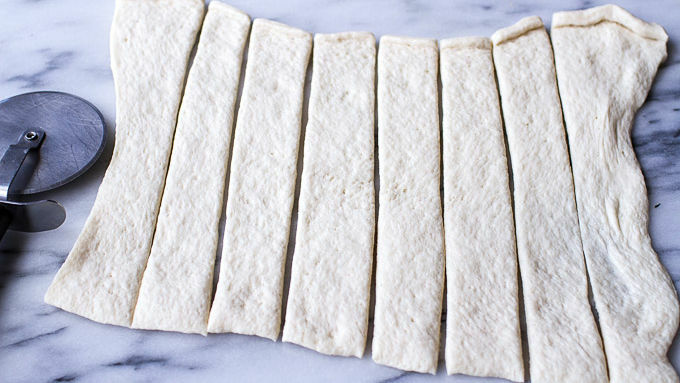 Now take a rolling pin and, working with one strip at a time, roll each strip out into a rectangle (about 11x3 inches). 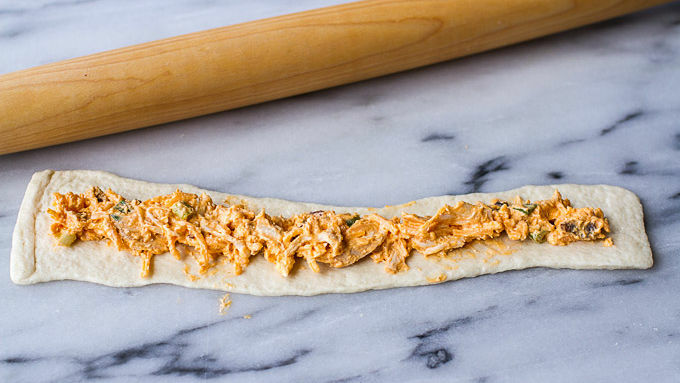 Spread about 1 1/2 tablespoons of the buffalo chicken filling along the length of each strip. Starting with the opposite side, roll the dough up into a log, enclosing the filling inside. Pinch the seams together and then very gently roll the dough with your hands to form an even cylinder that fully encloses the filling. Take the two ends of each filled cylinder and form into a circle that is overlapped by a couple of inches of dough on either side. Overlap the two ends and lay over the opposite side to form a pretzel shape, then press to seal. Place the pretzel on the prepared baking sheet. Repeat with the remaining dough and filling. Brush the tops of the pretzels with the beaten egg and season liberally with sea salt. Bake for 15 to 18 minutes or until pretzels are golden brown. Meanwhile, make the dip. In a bowl, mix together the mayo, buttermilk, Greek yogurt, lemon juice and Worcestershire. Stir in the blue cheese and season with salt and pepper. Place dip into a dish to serve with the hot baked pretzels. Enjoy! The pretzels can be prepared in advance and then baked right before serving. Store the blue cheese dip, covered, in the fridge until serving. 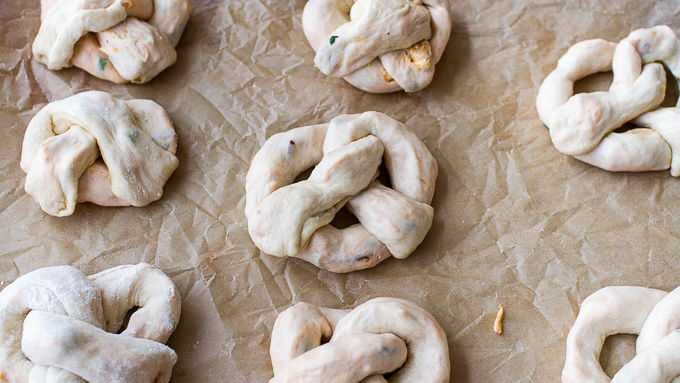 If you don’t want to take the time to shape the pretzels into pretzel form, just make pretzels bombs instead. Cut circles out of the dough and then enclose the filling inside. 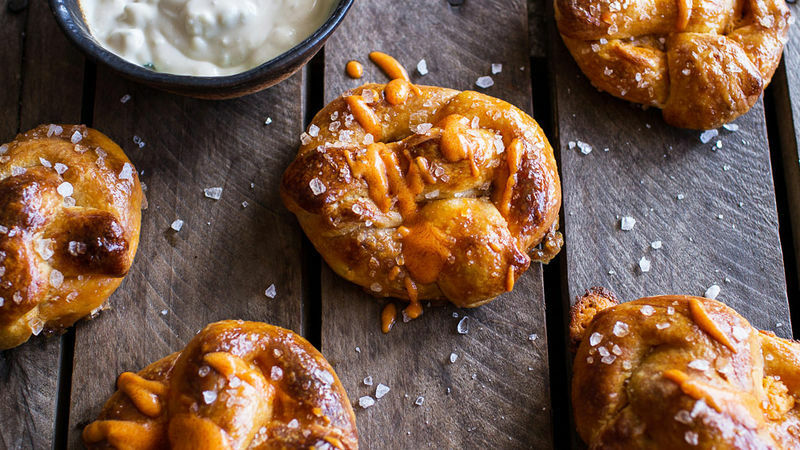 Refrigerated pizza dough makes easy pretzels, and buffalo chicken dip makes an easy pretzel filling.They look incredible. They smell incredible. They taste incredible. They ARE incredible. Oh my gosh. You guys. I stuffed buffalo chicken dip into a soft pretzel. Yes, I did. It just seemed so right and so natural. I mean, what could be better than pretzels, cheddar cheese and buffalo chicken? Total fall comfort. All you need is a cold beer and your favorite team on the TV. I've become a tad obsessed with soft pretzels and stuffing them with delicious things. So it was only a matter of time before I stuffed one with one of my favorite dips, and I really cannot think of a better time of year for these pretzels. The weather is turning cooler and the football season is in full gear. Which means it’s time to cozy up to some of our favorite foods. You know?? Trust me, once you make these you'll be happy you did. Definite crowd pleasers! The pretzels can be prepared in advance and then baked right before serving. Store the blue cheese dip, covered, in the fridge until serving. 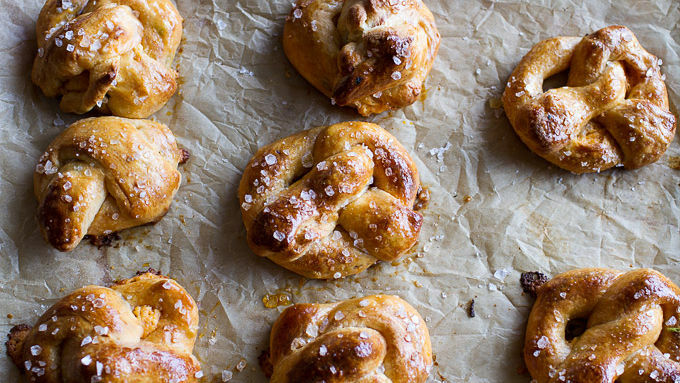 If you don’t want to take the time to shape the pretzels into pretzel form, just make pretzels bombs instead. Cut circles out of the dough and then enclose the filling inside. Grab the pretzels from the oven and serve them hot alongside the blue cheese dip. Oh, and maybe some extra buffalo sauce too. Dig in!